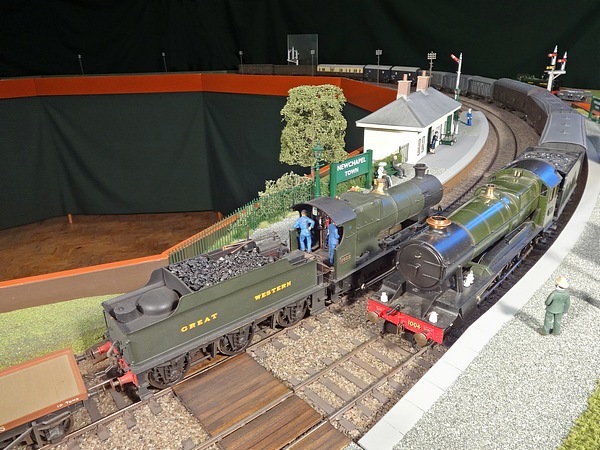 Newchapel Junction is a large privately owned finescale “O” Gauge exhibition layout representing a railway in the post grouping period somewhere in the Yeovil area where the SR and GWR ran together. The layout recreates the operation of a busy railway in its heyday with frequent arrivals and departures from the main station. The locomotives in use vary from large mainline express passenger types to humble tank engines of both SR and GWR origin. Engines from trains arriving at the main station proceed to the loco yard to be turned before either going on shed and being replaced by a fresh engine or returning to their trains for the next outbound movement. A large 5-road goods yard enables continuous shunting and remarshalling of freight trains. A complex triangular junction connects the main station and good yard to a double-track mainline circuit where trains can be seen running at speed. The whole layout is signalled with a mixture of GWR lower quadrant and SR upper quadrant semaphore signals which are fully working and illuminated. The layout can be assembled with or without a single-line branch which diverges from the main line circuit and leads to a terminus station which is served with a frequent service of local passenger and goods trains, together with the occasional mainline excursion. The signals are fully interlocked and the layout is controlled by relays, which are operated from four panels and a mechanical lever frame. Train describer instruments are used to control movements between the station and the mainline circuit via the triangular junction. Movements to and from the branch line are controlled by block instruments and bell codes.